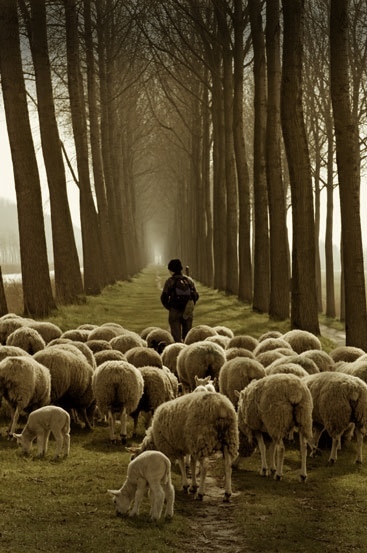 Follow the Good Shepherd. Ignore and Unfollow the Ambiguous. My social media feeds are often filled with replies and responses to the musings of a rather popular social media priest. Many times, the responses are from faithful Catholics who are angry about something this priest has written. His posts are designed to bait faithful Catholics. On cue, they respond harshly to his posts, which then allows him to say, "Look how unchristian these supposed Catholics really are." He usually won't come right out and contradict Catholic doctrine, but he masterfully undermines it. Sometimes he says things that are outright false. Either way, he provokes people into responding and, by doing so, stirs up publicity for himself and cleverly gets his message out there to more people. In other words, the people who do most of his work in spreading his harmful musings, are the people who are arguing with him online. He provokes them into becoming angry so that he and his message appear like the victims, and those defending the Catholic teaching appear (sometimes rightfully so) mean and angry. Mystery and ambiguity are not synonymous in the theological life. In the Christian dispensation, Mystery reveals Himself. Mystery is a Truth that we can come to know and to love. On the other hand, those--especially those entrusted to be shepherds in the Church--who sow ambiguity about God, the Church, and the moral life obscure the Truth. They do not help people to walk in the light. Rather, they lead them deeper into the darkness. The shelf life of such ambiguity is short. Ambiguity does not create converts. Ambiguity does not create vocations to the priesthood and the religious life. Ambiguity does not lead to repentance and the Sacrament of Confession. Ambiguity abandons the Cross, the Sacraments, and doctrine. Ambiguity is the drunk guy at a bar trying to be a philosopher, "But do we really know that we are here right now? Maybe we are somewhere else or maybe we don't even exist." Such statements are intended to sound profound, and maybe if you are drunk at 2am, they sound that way. But, if you're sober, they sound absurd because that's what they are. Undermining the Catholic Faith and sowing ambiguity is not intellectual. Frankly, it's boring, lifeless, and going nowhere. When faithful Catholics take such ambiguity seriously (getting upset and arguing), we give it way too much credit. It's so much better to ignore it. Mystery communicates new life. Ambiguity brings death. Is it upsetting to watch a shepherd lead others astray? Of course it is. But, perhaps the best fraternal correction that we can offer such a shepherd is to refuse to be his publicity agents. The Catholic life is truly beautiful. We can defend it best by showing how that life is beautiful and filled with grace and holiness, not by anger and bitterness. The Good Shepherd leads his flock to life giving pastures and He feeds them. Follow Him. Unfollow those who lead astray.